Blizzard wants World of Warcraft to live for another ten years, so it's safe to assume the studio won't rebuild the MMO from scratch, if that's even possible. That's fine, but computer graphics have advanced enormously since 2004, and none of Blizzard's iterative graphical improvements could hope to compete with, say, an open world RPG running in Unreal Engine 4. 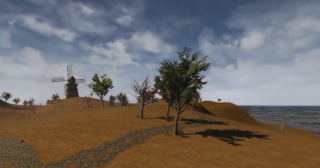 Thankfully YouTube user Daniel L (aka Daniel Luchau) has painstakingly recreated WoW's Westfall area in UE4. The video above is a virtual tour of the region (sans NPCs and players) with dynamic lighting and shadows. According to the video description Luchau pulled textures from CGtextures.com and Unreal demos, but also extracted some models direct from the source material. This isn't the first of Luchau's UE4 videos: he also recreated and filmed the Elwynn Forest area. Eventually he'd like to release the builds to VR platforms, which is very exciting indeed.